Elvis the Calculus Wonderdog! Elvis loves to play fetch. We stand at the water's edge at A, and throw the ball into the water to B. Elvis' excitement level suggests that his objective is to retrieve the ball as quickly as possible. That is, he attempts to find a path that minimizes the retrieval time. His running speed is 4 ft/s and swimming speed is 1 ft/s. (You can adjust these using the sliders) Suppose you decide to race Elvis to the ball. To be fair, you must run and swim at his speeds. To minimize your fetching time, at what point should you jump into the water? That is, what should be the distance from A to D? Investigate your fetching time by moving the point D around. 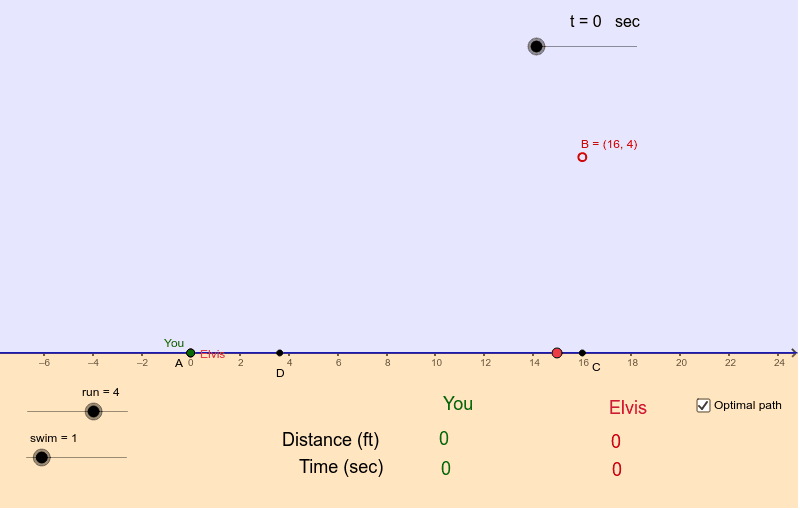 To see Elvis' optimal path, check the box named 'Optimal path'. Can you find this optimal path? Are you as smart as Elvis, the calculus dog? Worksheet created by Keshav Mukunda.